punches. I was a geeky little lad who wore Mario tracksuits and had a bowl hair cut. This gave me about 48 hours to play through an entire game, it didn’t occur to me to borrow the same game again next Friday. 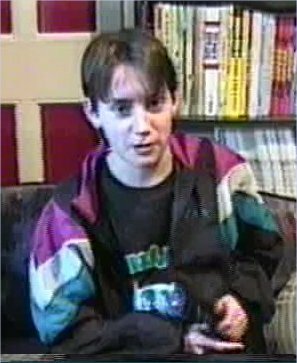 There was one child I swapped with called Ryan, who was the sort of child who had a lot of games, probably a new one every week. I think his Mum worked in Woolworths, got a discount and loads of free pick and mix. One Friday, swapsie day, I had asked Ryan to bring in a game I really wanted to play called Bionic Commando. “Sorry” he said, “I lost it – but you can borrow this if you like it’s the same thing”. I’m paraphrasing to give you a sense of occasion, the real conversation probably included the phrases “rad” or “cowabunga”, it was 1991 after all. The game he borrowed was Solstice, the game I borrowed was Mega Man 2 and thus a love for a little blue bomber was born. Considering that my weekend was equally shared between playing games in my room and climbing trees, I couldn’t have had long with the game over that weekend. 15 or so hours, and whatever time after ‘lights out’ that I could sneak without my parents noticing. In that time I not only finished Mega Man 2, a game now known for its difficulty, I could finish it in one sitting. How on earth did I manage that? I was 9, and I even figured out the best order to take on the robot masters without the internet (the idea of every computer in the world being connected was the stuff of science fiction in 1991). But it didn’t stop at Mega Man 2, I recall playing through several others with equal amounts of success and ninja reflexes. I really enjoyed them; I liked the funny little blue man and adored the music. It’s a mystery then why come the 16 bit era I never played Mega Man X, especially when my beloved Super Play magazine sung its praises almost every issue. I first actually played this as Mega Man Maverick Hunter X on the PSP, which I got in one of those Impulse “I used to love those as a kid” moments. Though the game is a modern day remake, it maintains the bulk of the original at its core. The look make be 2.5d, the music may be more elaborate, and there may be anime cut scenes, but for me there is more charm in the original. There is elegance and beauty for me in pixel art and Mega Man X is literally pixel art at its best. Detailed, colourful, varied characters all wonderfully animated. But the beauty doesn’t stop at the player sprites. The backgrounds with their seemingly infinite layers parallax scrolling allude to a futuristic world taken straight out of an Astro Boy anime. Each level unique in its own right, but uniform in a way that makes the game feel cohesive and rich. 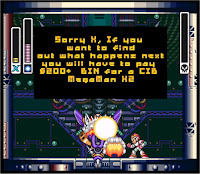 Some games such as Donkey Kong Country or Starwing may make people marvel at their technical prowess, but Mega Man X simply looks incredible through mastery of the pixel sprite craft. The music too sounds like the greatest hits of a modern day Chip Tune composer, and its clear why this game is often remixed by those so inclined. Catchy, memorable, without being distracting and irritating or repetitive. It’s telling that the modern day re-imagining in Maverick Hunter X, that was designed to appeal to a modern day player, is much less attractive to me. The excess of guitars and pounding bass lines take away from the purity, take away from the melody, take away from the genius. Considering this game looks and sounds this good, it’s astonishing that the gameplay matches up. For me, its the perfect pitch of difficultly – challenging without being frustrating. I love the subtle mix of exploration and action. How you need to experiment with the optimum order to take on the levels and their robot masters. I didn’t realise till multiple play through too, that beyond the normal route of each level lay hidden bonuses and secrets. Forcing you to be creative with your newly found abilities and retread old ground in an almost Metroid manner. It’s great when a game surprises you, and rewards you for creative approaches and taking risks. The boss may seem brutal on the first few tries (particularly Launch Octopus and the spider boss ) but thankfully the password allows you to try a different approach (albeit after a brief hiatus to replay the level). And what a moment it is when you discover how to beat each one, when your realise that what you struggled with could so easily be overcome with the right choice of weapon or the right method of attack. What a master stroke it is that the Megaman games include the bosses again at the end of the game. What once seemed so challenging now can be destroyed with ease and barely a drop of your energy is taken. X may be in awe of Zero at the start of the game, but by the end you are in awe at your own skills. You have a very tangible illustration of personal growth and its embodiment in the surrogate character. To those who don’t play games, the idea that one could inspire pride or a sense of huge accomplishment may seem impossible. But how wonderful that a game such as this can inspire in me such positive emotions and that they feel earned and deserved. This may all sound like a glowing flood of praise for the game but don’t be fooled into thinking it’s perfect. There’s all sorts of niggles that should really have been reconsidered as the game moved from 8 bit to 16 bit. X’s inability to fire in any direction other than left or right seems excessively limiting. The imprecise dash jump that you depend on to reach so many upgrades can be unpredictable and for a little guy decked out in futuristic armour why does he have such a problem with spikes. But these niggles are exactly that – nit picking and searching for failings when the positives are much more abundant. For the price tag the game now commands, the length however is less than you would hope. Indeed the briefness of the game is something that was universally criticised upon the original release. Perhaps though this is the greatest compliment you can give anything, a reluctance for it to end means you are really enjoying something and want the experience to last as long as possible. The hours I’ve spent with this game have been some of the most enjoyable since I picked up the old controller. So much so that the temptation to pay what would amount to literally 83 years worth of pocket money for the sequel is almost too great to resist. In my previous blog post for Shadow Run I talked about a gaming friend I had met on Twitter. Picture the scene; we are sitting in a Zelda Orchestral Recital together chatting about this very blog. ‘What game is top of your wish list’ he asks, ‘Mega Man X’ I respond. Low and behold, a few weeks later what should drop through the letter box? Once again I must extend my thanks to my new online friend Paulo for reuniting me with an old friend in Mega Man. I now however also own a boxed complete copy thanks to a certain Mr. Andy. I paid a great price (much less than I thought people would part with it for!) and it's as immaculate as you could hope for. Envy me! Megaman games are my favorite games. But they are too difficult for me, but Megaman X games are easier I think. Did you wnat blog more words. have you played any OTHER MEGAMAN GAMES? I prefer MegaMan 7 on Snes, will you do that next? I have just posted my thoughts on X2 if you fancy having a look at that? I'd love MM7 but the price for Boxed complete copies is terrifying!